Push press is on overhead pushing exercise that can help build overhead strength. It will help you train the jerk portion of the clean and jerk. By using explosive leg drive you create momentum to initiate the push. By doing so, you are able to overload with weights you would not be able to lift with a strict overhead press. 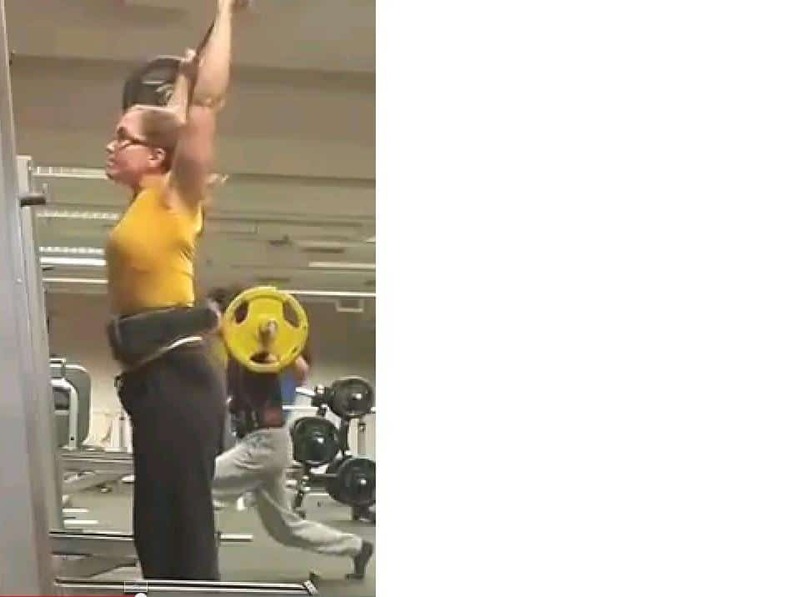 Equipment: If you’re not familiar with the clean movement to bring the bar up to your chest from the floor, you may want to set the bar up in a rack and pick it up from there. Hand placement: Grip the bar slightly outside shoulder width. Forearm Alignment: Begin with the upper arms parallel to the floor, as you would hold the bar for a front squat. Foot position: Use a wide stance, outside shoulder width with your toes pointed out. This will allow you to keep your torso upright more easily as you dip down to begin the lift. Posture: Your lower back is slightly arched and your chest up. Hold your head and chin up at the start of the lift. Before beginning the dip, take a deep breath of air into your lungs and abdomen and hold it, pushing it down and tightening your core to create intra-abdominal pressure. Dip down, performing a quick, shallow squat. Do not drop below the point where you are at the top of the power curve in your squat, between a quarter and halfway to parallel – this is not a full squat. Drive back up powerfully, pushing through your heels. Transfer the momentum from your leg drive to the bar, pushing it over head explosively. As the bar goes overhead duck under the bar pushing it directly over head. Exhale as you lock the bar out. Complete the lift by locking your elbows with your wrists, forearms and upper arms in direct alignment overhead. Bring the bar back down to your chest. As the bar reaches your chest, dip down again to absorb the blow. Reset, bringing your elbows and upper arms back up for your next repetition. You should be able to push press more weight than you can with a strict overhead press, due to the use of lower body momentum to drive the bar off your chest. If you’re not familiar with the movement, keep the bar weight light until you have mastered the lift technique. Your shoulders are a somewhat vulnerable joint, use a manageable weight for this exercise. Lifting too aggressively and increasing the bar weight too quickly can increase the risk of injury. Squatting too low: performing a full squat with this exercise will prevent you from driving up as explosively as necessary. Dipping forward: dipping forward as you drop down and drive back up will not allow you to transfer all of the power from your leg drive to the bar. Use a proper weight for your strength level and skill with this exercise. If you have lower back issues, consider using seated variation of an overhead press to minimize stress on your back. If needed, use a weight belt when performing this exercise to stabilize your lower back.